While your fanboy friends rhapsodize about the ersatz Krampus of American movies and comic books, tonight you’ll get a glimpse of the old devil in his oldest, purest form – the Krampus of the ancient alpine “Nikolausspiel” or NICHOLAS PLAY, a folk theater genre dating back to the 18th century and resembling England’s Christmas mummers’ plays. The Nicholas Play is a primary origin of the Krampus tradition, and for tonight’s presentation, we’ve translated scenes from surviving German scripts to give you a taste of how the Krampus was experienced in Alpine villages of centuries gone by. While all this cultural import may sound too serious for fun, we’ve not forgotten our audience. Our Los Angeles production combines only the most attractive and amusing scenes involving the Krampus, Lucifer, butchered children, and the inexorable power of Death,, all represented in bouncy rhyme. Whether speaking of eternal salvation or the merciless tortures of Hell, the dialogue of the Nikolausspiel is inevitably delivered in cheery couplets worthy of Dr. Seuss. Following the play, we’re presenting a program of specially curated FILMS to give you a glimpse into the rough-and-tumble world of the Krampus as he existed in the early part of the 20th century and today. In rare footage from the Austrian State Archives, you’ll see characters from the Nicholas Play you just watched bursting into homes and taverns, Krampuses carrying off armfuls of children and engaging in pranks, property damage, attempted theft, and heavy drinking. Other shorts depict the most violent Krampus activity in the world, parades of child-Krampuses, and entertaining bouts of hysteria that attend the devil’s appearance. Guests for our double bill are invited to come in themed wardrobe, period clothing, or holiday attire, festive or grim. 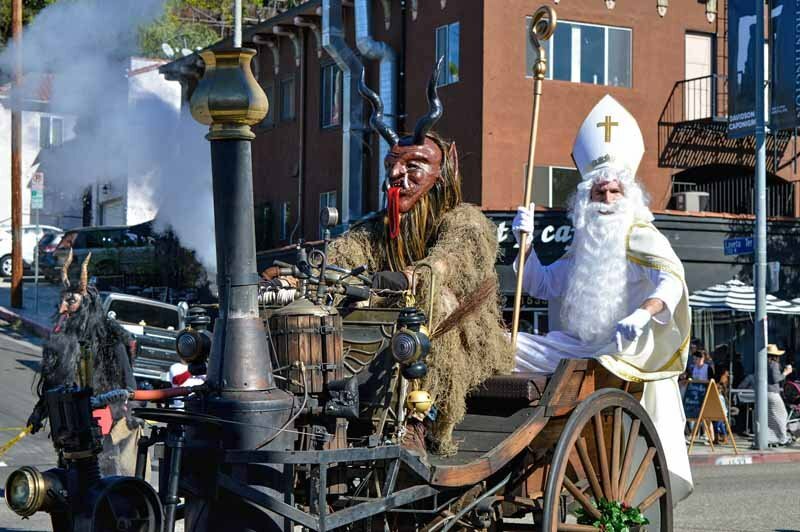 On hand will also be Bay Area artist Kimric Smythe’s KRAMPUS-DRIVEN STEAMCAR. 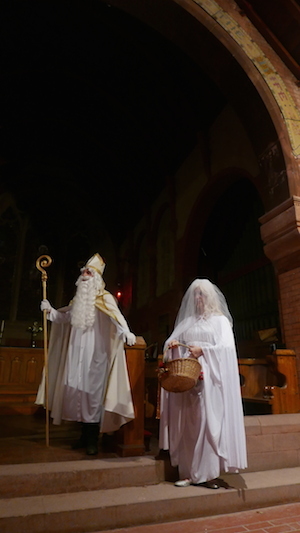 The event takes place amid the candles and stained glass of the historic CHURCH OF THE ANGELS, an exquisite Gothic Revival edifice built in 1889.